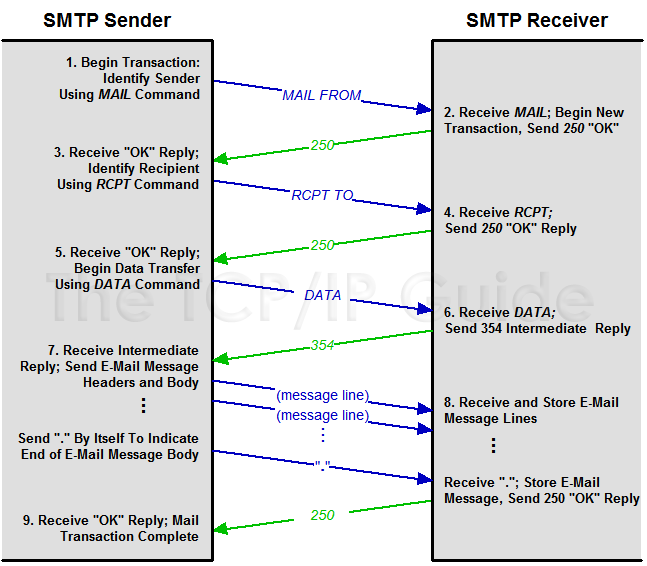 Once an SMTP session is established between a sender and receiver, each mail transaction consists of a set of three command/reply sequences. The sender is first identified using the MAIL command and the recipients are specified using one or more RCPT commands. The actual mail message is then transferred using the DATA command, which involves a preliminary reply before the actual message is sent, and a completion reply when it has been fully received. The SMTP sender then sends the e-mail message, one line at a time, with a single . on a line to terminate it. The server confirms the receipt of the message with another 250 OK reply, and the transaction is done. Hope you are free. Send me a reply back when you get a chance. Key Concept: After an SMTP session is established, e-mail messages are sent using the SMTP mail transaction process. The SMTP sender starts the transaction by identifying the sender of the e-mail, and then specifying one or more recipients. The e-mail message itself is then transmitted to the SMTP receiver. Each e-mail to be sent is a separate transaction. While this indeed is quite simple, I should point out that I have only shown an e-mail from a sender to one recipient, and the case where there are no problems or complications in the transaction. Due to either command syntax or server issues, it is possible for various types of errors to occur at different stages of the process, which may result in the transaction failing. There are also security concerns that may come into play, that may lead to restrictions in what transactions a server may allow.